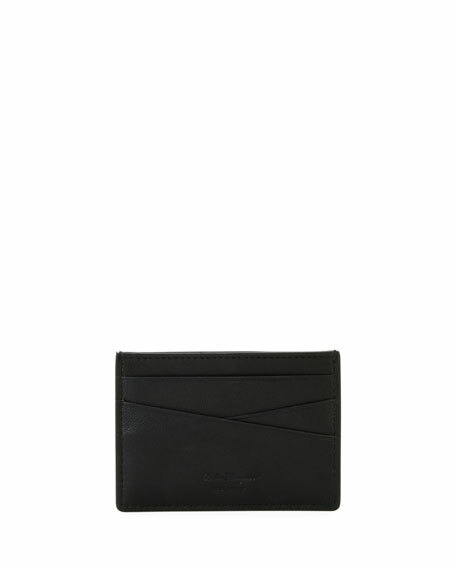 Salvatore Ferragamo card case in grained leather. Tonal Gancio logo detail at front corner. Salvatore Ferragamo card case in Gancio-embossed leather. Grain leather interior with embossed logo. Two card slots; ID window. Vertical orientation. Salvatore Ferragamo card case in Gancio-embossed leather. Grain leather interior with embossed logo. Two card slots; ID window. Vertical orientation. Made in Italy.